If you didn’t know better, you’d think that Laura Poitras’s “Meet Edward Snowden” documentary Citizenfour was an avant-garde paranoid conspiracy thriller. Hold on, it is an avant-garde paranoid conspiracy thriller. It opens with a blurry tunnel; winking monitors scrolling metadata plucked from Americans’ emails; images of huge, futuristic, otherworldy government surveillance centers; encrypted communications — flurries of characters — that resolve into edgy cyberdialogues between the National Security Agency whistleblower and the filmmaker; and, finally, exacting exchanges between Snowden and journalist Glenn Greenwald high up in a blankly modern Hong Kong hotel, which might or might not be bugged. The music by Trent Reznor and Atticus Ross is like malignantly buzzing wires that eat into your cerebral cortex. The narrative is relatively straightforward. 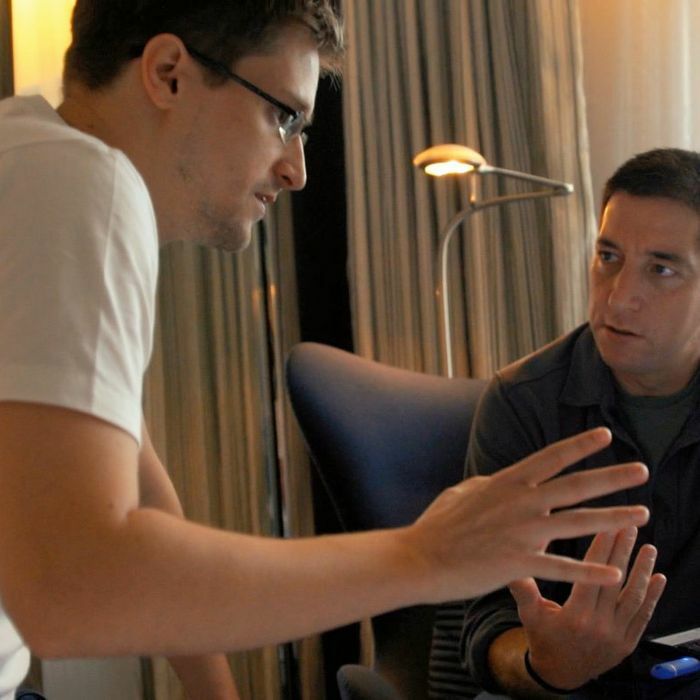 Poitras explains in voice-over that in the summer of 2013, she received a communiqué from a man calling himself “Citizenfour,” who also asked her to alert Greenwald of Britain’s Guardian newspaper. (Poitras doesn’t tell us that Greenwald initially blew citizenfour off for whatever cranky reasons, but came into the fold when contacted by the documentarian.) What follows is an introduction (some of it via former metadata collector William Binney, who hobbles around on an impressive metallic leg) to all the ways in which the NSA intercepts hundreds of millions of communications from ordinary Americans and lies about it. Here is NSA head General James Clapper before Congress. On the evidence, he is witting as hell. And congresspersons — among them the Dems’ own Nancy Pelosi — allegedly knew the full extent of the NSA’s reach. A password is established for Poitras to contact a person playing with a Rubik’s Cube. Then we’re in a Hong Kong hotel room with the man himself: “I am Edward Snowden — Ed,” he says. He is an employee of Booz Allen “on loan” to the NSA. He can no longer, he avers, bear the lying of his government. (Poitras does not explore his motives more deeply than that.) He explains the breadth of the classified documents he has stolen, most from the NSA, some from a possibly even more invasive British program with the cute name Tempora. (It would have been even cuter as “Yack-a-Tory.”) Snowden gives The Guardian and other papers everything because, he says, he “doesn’t want to be the person to make the judgment on what should be released.” Poitras doesn’t probe that cosmic shrug, either. The hotel scenes go on a tad long, but what holds us is that we’re right in the room as history is being made — with the guy, the actual guy, soon to be notorious all over the world. Poitras’s penetrating docs My Country, My Country and The Oath earned her a place in this room (she now lives in Berlin in an attempt to evade scrutiny), although she doesn’t turn the camera on herself or talk much. Greenwald, for his part, isn’t a particularly endearing interlocutor, though he’s a fluid and effective spokesman in news programs that Poitras excerpts. He’s humanized when his partner, David Miranda, is detained by agents for nine hours at an airport, ironically without Miranda rights. When Miranda is finally released, Greenwald’s relief is very moving. We watch Snowden watch CNN break news of his massive document dump. Snowden’s name is released immediately — he knew secrecy would be impossible. U.S. agents don’t waylay him, in part because he makes a beeline for the Russian embassy. Poitras doesn’t quote his public testimonial to H.K.’s “spirited commitment to free speech and the right of public dissent,” which would, at the moment, be cringeworthy. She really is very protective. Citizenfour ends with a teasing scene in which Greenwald informs Snowden — via scribbled notes the camera mostly doesn’t see — of another high-up whistle-blower. Snowden expresses concern for his or her safety. His eyebrows go up when he learns the extent of the revelations. The word POTUS is floated in a pointed peekaboo. Perhaps said revelations will be tied to the release of citizenfour, which will be the best kind of advertisement imaginable. You should see this movie if you’re naïve enough to think you have a right to privacy. But don’t buy your ticket online or with a credit card.